Good Food is Australia’s premier destination for eating out, eating in and everything in between. 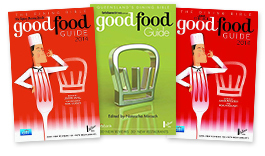 Through the Good Guide series, Goodfood.com.au, and newspaper lift outs it has gained an unparalleled reputation for independent reviews and recommendations. Trusted by a broad range of consumers, the Good Food reputation has been built over more than three decades. Good Food are proud to have a licensing agreement with Edge Loyalty to focus on the exciting Australian dining scene and look at new ways to engage and extend the Good Food experience to customers. What better way to do this than by creating a Good Food Gift Card. Did you know when a restaurant is referred to as having 1,2 or 3 hats, this is from Good Food Guide’s ratings? You can take a look at the hatted restaurants you can choose to dine at here. Want to know more about the Guides?